At the very forefront of modern biology is the need to understand how selection drives genotype, and how genotype translates to phenotype. 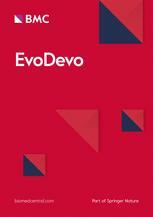 EvoDevo publishes cutting-edge research across evolutionary, developmental biology – integrating fields and techniques to ensure our understanding of embryogenesis, budding or regeneration is complete and accurate. Our international editorial board are world experts in the field and share a mutual passion for evolution.